Muscadines: Buds are breaking in muscadine vineyards in Georgia’s coastal plains. We are likely a week or ten days out from seeing bud break in muscadine vineyards in the Georgia piedmont. 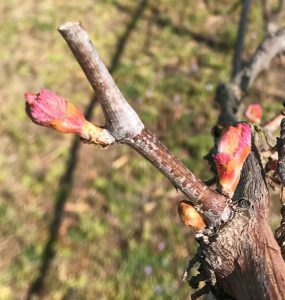 Bunch grapes: We are seeing buds breaking throughout the piedmont and foothills of Georgia. Bud break is mostly observed in hybrids planted in the piedmont, but bud break is coming on fast in hybrid and V. vinifera cultivars in the foothills around 1200 to 1500 ft. above sea level. Bud break in Lomanto is Hall County, Georgia. Photo courtesy of Mary Siebenmorgen. Just FYI – hopefully all are finished pruning at this point. Get ready to implement active frost protection measures, if you have them. Those at higher elevations (Ellijay, Tiger, western NC) will likely be seeing bud break start sometime next week or the week after (obviously cultivar- and site-dependent). Best wishes to all for avoiding frost over the next several weeks.